Leaving behind questions of figuration and abstraction, passing by issues of innovation and tradition, skipping struggles between constructivism and realism, Alex Katz investigates painting matters from the inside of their materiality. Independent from the decision of dimension or the choice of color, those paintings testify a seldom density of energy, a rare mental concentration, translated in metaphysical vibrations through physical strength. Surfaces to get drown. Brush-strokes to get hit. Color-fields to get lost. Landscapes to get wrapped. Katz defines himself as a post-abstract painter: on the one hand he exclaims, that he “never wanted to paint abstract”, on the other hand, that “the grammar of his painting is abstract”. A contradiction? In the catalogue of Alex Katz’s show Landscapes at “Haus Konstruktiv” in Zürich, the director Dorothea Strauss, names this specific moment of being suspended in the middle, a “subtle tipping point” between abstraction and figuration, between construction and sensation, between geometry and float. Indeed, Alex Katz is discussing painting as a separate matter, rather than thinking about the objects which appear and disappear, which we might believe to perceive. Thematizing painting itself means questioning the status of a picture, of any picture. So, what is a picture? As Magritte learns us, the picture of a pipe is not the pipe itself, but merely a two-dimensional reproduction of a three-dimensional object we call «pipe». As pragmatism learns us, a painting is just made of some color-pigments with binding agents on a surface like paper, canvas or carton. And last but not least, as physics learns us, a painting is in the end a mass of atoms made of electrons, protons and neutrons in perpetual movement. All picture is an illusion, all representation is mere appearance, inviting us to tell stories, to dream, to go on a trip within imagination. The 85-years old American artist Katz, is considered one of the most important painters of the present. He studied between 1946 and 1949 at the New Yorker Cooper Union School of Art and later at the Slowhegan School of Painting and Sculpture. Although since then he handles classical painting themes like portraits, landscapes or still lives, he pushes the threated genre over it’s own historical boarder. The genre and the represented subject as well, are indeed a pretext for the real content of this huge oeuvre to come through: the act and the experience of painting as a continuous practice and learning process. 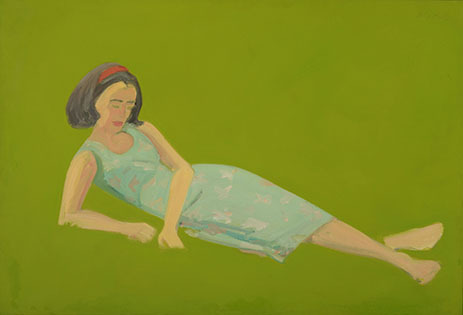 The concentration on creative producing itself leads to a very particular understanding and translation of the «landscape» issue in Alex Katz’ oeuvre: the spectator sees himself confronted with huge surfaces of clean and clear flat colors, painted all over the gigantic art-pieces, following their precise geometric composition. Those landscapes reach human-size, able to wrap the spectators, to involve them with their entire body. The concept of «Land-scape» goes here back to its original meaning: land-shape, the form of the land, specially in the perception of an observer. In the «European Landscape Convention», we read the following definition: «Landscape means an area, as perceived by people, whose character is the result of the action and interaction of natural and/or human factors» (1). By it’s definition, landscape is not just a given «object» that exists by itself, but rather a «subject» born out of human’s observation and perception. It’s a cultural construction. «Landscape» only exists through our gaze, the concept is born in a precise historic moment, the concomitance of the first autonomous Dutch landscape-paintings in the end of the 16th Century, while before, during Renaissance painted countryside was limited to an existence as a background for theological representations. The word «landscape» is born with the depicted representation of the farmers outside space, with the image of a framed Nature-view, when the gaze of the artists descended from the sky to the earth, from the Divine to the sensible world, where the mortals daily life has place – only from this moment on considered worth to exist in art. In that sense «landscape» becomes a sort of metaphor for the viewing process on itself. As Alex Katz exclaims in an interview with the Austrian «Standard»: «seeing is culturally defined» and on the Swiss radio SRF 2 he’s adding, «you think, what you see with your eyes is real, but it is culturally built». This means, when we admire a real country-side, present before our eyes, we see through the glasses of the whole «landscape»-tradition, to start with Pre-Renaissance Giotto, Renaissance Leonardo da Vinci, the 16th Century Dutch art, the Romantics Corot, Constable or Turner, until impressionism and postimpressionism with Monet and Cezanne. BF: Nice to meet you! 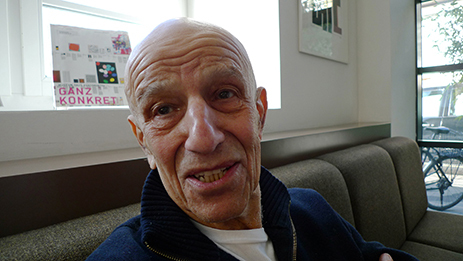 In the past, you gave interviews to colleges, for example Francesco Clemente or Richard Prince. How do you relate to other artists? AK: Well, Clemente is a friend and I thought he was like the best thing that came out since De Chirico in Italy. And Richard Prince was a sort of dynamite with words and he came over to talk about my works and so I asked him and we had a great interview. BF: I was wondering about this choice, because I imagine the work of a painter as a very solitary situation. AK: No it’s not, you just do it lonely, but it’s a social activity, basically. BF: In this show, there is an «Hommage to Monet». And it is the only explicit quotation or relation to another artists work, but when I see your paints, I have continuous enlightenments, thinking on different steps in art history. Is your oeuvre picked with subtle and implicit allusions even though it’s unique and original? AK: We live in a postmodern world and you are able to use any source you want. A lot of my work comes from me. I use myself as a source, because I did things forty years ago and they are as interesting as anything else. But that opens up the whole discourse of tradition. I think my paintings look new and at the same time they are traditional. BF: You said somewhere that you don’t care to be traditional, but if I look at your work, I don’t perceive it as a traditional work, I mean it’s not because you paint traditional genres like landscapes or portraits, that you are necessarily traditional. AK: No, it relates to paint. It’s not traditional. It’s an idea of making a new painting. BF: Could we affirm, that the objects of representation are a pretext to talk about painting itself? AK: Well, of course, it’s about painting, but it is about – like most traditional representational painting looks old – the idea of making one new. I’ve been influenced by a lot of abstract painting. So, in this sense it’s a post abstract painting. BF: Yes, in a video on Youtube you say that the grammar of your painting is abstract. And now we are at “Haus Konstruktiv”, which is – as everyone – not an innocent place, in a way, the meaning of the context is directing the lecture of the work. AK: Yeah, it fits. They can read the «grammar of the paintings». AK: It’s the point of being like what you see is a variable, you know? And it’s changing all the time and I think my paintings look more realistic than Rembrandt. Those paintings don’t look realistic to me. They’re maybe great paintings, but they are not realistic anymore. BF: So, what means realistic for you? AK: Realistic is when your vision dominates the culture. Then it’s realistic. Our culture is dominated primarily by photographs and movies and I have a dialogue with that and it’s to say, well, my paintings are more realistic than a photo. I mean you have more the sensation of seeing something in my paintings than in a photo. A photo looks like a photo and I get more into the medium presence. That’s what painting does, actually. BF: We now may talk about the framing of your pictures and their dimension. Having those huge sizes, the landscapes come into a naturalistic dimension and the spectator gets into it, or better gets even a part of it. BF: It’s not just a gaze on a picture, but involving of the spectator. AK: That was exactly the intention: to paint an environment as a landscape, rather than a picture as a hole in the wall. AK: Yes, that’s not a window, the paint wraps around you. And they need a certain size to do so. I try to make them as small as I can, but the size is an important factor. The idea of going figurative by scale has no precedent. It’s like going to an unknown area and I didn’t know whether it would work out or not. Once it’s done and other people adapt things it doesn’t have the initial novelty, anymore. BF: I think, to understand your further evolution, the small collages from the Fifties, in the show, are very illuminating. AK: Well, they set it all up. BF: It’s as if they would reveal the origin of your work. BF:As a sudden you understand why the colours are so flat, why the forms are so clear. For me it was a sort of enlightenment, to see them. AK: They say that the scale was really experimented with the collages and I brought them into the large paintings. The large paintings were easy, after the collages. BF: Yes, but how can you manage to obtain this great facility, this lightness in this gigantic scale? AK: That’s the whole thing. BF: How does that work? AK: Well, that’s the thing I’m most proud of, that’s the surface. It’s mostly for painters who say, eat your hart out. They’re never going to be able to do it. (laughs..) It started when I decided to try a wet in wet technique and I used to go to Madison Square, which was across the way and I decided to work wet in wet. And wet in wet is usually for small and bad paintings (laughs). AK: Yeah «Bad painting» uses wet in wet. And it makes a big fluent surface, the wet in wet, like the one with the yellow flowers. The whole canvas is painted white and then the paint is put into the white paint. AK: Like “fresco”, yes, wet in wet and it’s a tricky stuff, because the under paint has to be right to receive the top paint and the top paint has to be put on right and the inflections make differences. And so you get a lot of multi tones that way, with the wet in wet. I have painted the big paints in five or six hours. BF: Alone or with some help? AK: The yellow one was about six hours, that’s all. BF: Are you making sports? AK: Yeah, I do a lot of athletics. BF: Because it’s physically very tiring. AK: No it’s not that tiring, but I do a lot of physical work, yeah. BF: The last question is a little bit personal: how does it feel to work on your oeuvre for sixty years, for such a long time? AK: Well, that’s the big thing, I was very lucky to paint that long. To be a full time painter, I was paying the price when I was young, but I decided that I will do it. One thing leads to another. It’s not a conceptual thing. You have to learn how to draw. Then you have to learn how to draw people, then you have to learn how to paint. You know, it took a long time to learn the techniques. I don’t think, I was particularly talented. But I was very wilful and I worked hard on them, a lot harder than most painters. I really worked hard to develop the technique. I destroyed a thousand paintings from my twenties. BF: Really? You did that? AK: Yes, really. (laughs). A thousand paintings. I painted every day and in the end of the month I thought, well, the world doesn’t really need these paintings. AK: I just wanted to paint. I was curious about the immediate presence and I paint a painting and then another one and in the end of two years, it seemed the only thing I was interested in, is how much I learned. The painting itself was not interesting. I lived in a place that had no heat and I just used to bust them up and throw them into the fireplace. BF: So you were clearly more interested in the process, than in the result. AK: In the learning, yes. Some of the works although survived, for example the one in the small room in the show. Those are the ones I didn’t destroy. BF: How did you choose? AK: I don’t know. If they had too much labour on it, I may threw them away and if they were just boring and who knows, what I thought… (laughing). I don’t give a damn. AK: It was at the end of that more or less ten years period, I had a very strong technique and you have like a lot of audiences for the paintings. You have the man of the street who likes the image. You have the dealer who likes something he could sell. You have the museums curator who thinks it’s worth hang it in the museum. You have the writer who wants something interesting to write about. And you have the painter who is interested in the actual painting. There are different audiences who see in the painting different objects. You know. You can never control all the five at once. BF: So those contradictory expectations stressed you? Did you want to make a sort of conscious pre-selection of what you expected to be accepted by those audiences and what not? I cut some up to use them as corner supports on stretches. I was moving to new areas. I was doing representational paintings, plain air paintings and I didn’t come from an academy where we learned how to do it, so I had to do experiments. When I was making the paintings, I knew that they weren’t conventional. For me the second generation of abstract painters who were from my age, were doing beautiful paintings, but they were conventional. AK: Like Joan Mitchell who is from the same age, she is a very good painter, but her stuff is much more conventional than what I was doing with those collages. So there was no way knowing if they were good enough. I’m very surprised now, because they picked up paintings, that I never have imagined hanging on a museums wall.